Cattails and marsh grasses top this nature inspired light fixture. This Cattails Ceiling Light is finished in Cafe Noir with Amber Mica panels.Made in the USA. Cattails and marsh grasses top this nature inspired light fixture. 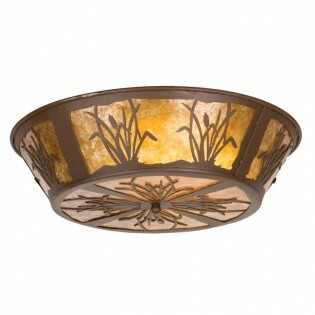 This Cattails Ceiling Light is finished in Cafe Noir with Amber Mica panels.